In this Post Techno Planners talk about How To Root Asus Zenfone, Zenfone 4, Zenfone 5, Zenfone 6 without any damage. This process tested on Asus Zenfone 5 which running on Android 4.3 operating system. Your phone battery should charge 50 % minimum. Step 1. Download Zenfone Root APK to your computer and place the same in your device or alternatively you can also download this apk directly in your phone. Step 2. Install the downloaded APK in your device which will be named as “Root Zenfone” and all you need to do is to just follow the on screen instructions for installing the same. Step 3. 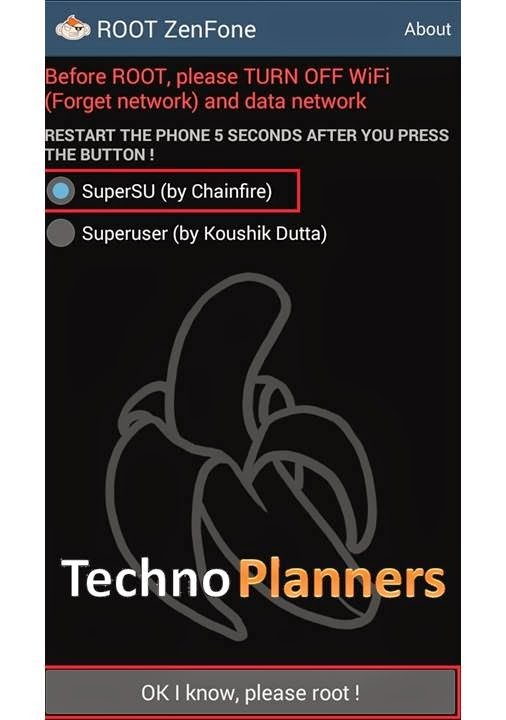 Once installed, Open the app and select “SuperSU by Chain fire”. Then Tap on "Ok I Know, Please Root". Step 4. After 10 Second, Restart Your Device, Its take 1-2 minutes for fist boot. Step 5. Once Restart, Open App drawer and find SuperSU. You can also verify you device is successfully rooted by using Root Checker App. Sorry for that issues, its working only on Asus zenfone with Android 4.3 operating system. I already describe in post its tested on Asus Zenfone 5 which running on Android 4.3 operating system. Same prblm ... not wrkng ..
does this unrooting app works for asus zenfone 2 also?